The political crisis raging in Bangkok took a break over the weekend as opposing parties enjoyed celebrating Songkran with the rest of the country. 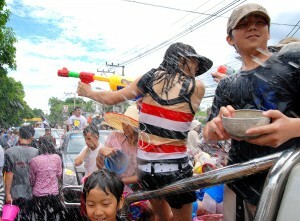 There were huge water fights across the country and at the political rally venues in Bangkok. Suthep Thaugsuban, the chief leader of the People’s Democratic Reform Committee took a slow ride on his morotbike through Lumpini Park and got drenched with water from his supporters. Caretaker Prime minister Yingluck Shinawatra and her son gave alms to 109 monks at the Tha Phae Gate in Chiang Mai. She then presided over the opening ceremony of the Chiang Mai Lanna New Year celebrations where she wished happiness for all Thai’s. However while most enjoyed Songrak for some it turned to tragedy, despite the seven day safety campaign. On day two 102 people lost their lives and 893 more were injured in 471 road accidents. The daily update was compiled by the Department of Disaster Prevention and Mitigation. Drunk-driving remained the largest cause of accidents (38.43 per cent), followed by speeding (25.27 per cent). Police pulled over 658,214 motorcycles and vehicles at checkpoints for inspection, with 99,896 motorcyclists and motorists fined for driving without licences and 32,674 for not wearing safety helmets.